As 2009 comes to an end, about half of the country is giving President Barack Obama a thumbs up. 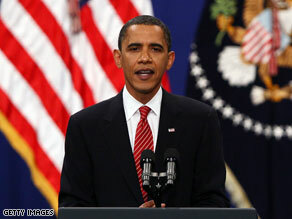 Washington (CNN) - As 2009 comes to an end, about half of the country is giving President Barack Obama a thumbs-up. According to a CNN Poll of Polls compiled and released Thursday, Obama's approval rating in polls taken in the past week averages out to 50 percent, with 44 percent saying they disapprove. "Obama's average approval rating was at 52 percent or 53 percent every week from early October to mid-November. Each week since then, his average approval rating has been between 48 percent and 50 percent," says CNN Polling Director Keating Holland. "The bad news for the White House is that his current rating is down by roughly 15 points since the start of the year. The good news is that it appears to have stabilized as the end of the year approaches." Since scientific polling began more than seven decades ago, only one popularly-elected president has ended his first calendar year in office with an approval rating below 50 percent. Ronald Reagan's approval rating dipped to 49 percent in December 1981, and stayed below 50 percent for two years - but he won re-election in a landslide, says Holland. By contrast, Jimmy Carter and the elder George Bush had approval ratings well over 50 percent in December of their first year in the White House, but lost their re-election bids. "So the first-year approval ratings don't appear to have any predictive value when it comes to re-election prospects," said Holland. The CNN Poll of Polls on how Obama is handling his job overall consists of an average of six surveys conducted within the last week: NBC/Wall Street Journal (Dec. 11-14), the Gallup tracking (Dec. 13-15), AP/GfK (Dec. 10-14), ABC/Washington Post (Dec. 10-13), Pew (Dec. 9-13), and Fox (Dec. 8-9). The Poll of Polls does not have a sampling error. Four of the six surveys in the overall Poll of Polls also asked about the president's handling of the economy, the number one issue on the minds of Americans. According to an average of those four polls, 45 percent approve of how Obama's dealing with the economy, while half of the public disapproves. Four of the six surveys also asked about Afghanistan. According to the CNN Poll of Polls, 50 percent, on average, approve of how Obama's handling that conflict, with 43 percent disapproving. Three of the surveys asked how the president's dealing with health care reform. According to the CNN Poll of Polls, 44 percent approve of Obama's handling of health care, with 51 percent giving him a thumbs down. The president's approval drops even lower for the budget deficit. Three of the surveys asked about the deficit, and the CNN Poll of Polls indicates 37 percent approve of Obama's handling of the issue, with 54 percent disapproving. WOW! So how did he earn his "B+" that he gave himself? I remember a 50% being an "F". Even after the Libs took over control of the grading system, I think it still was an "F". The ratings have stabilized as the lowest of any first year American president , give the man an award already. Obama said he did not believe in polls. How can anyone say he is doing good for the economy when the deficit is out of control? is it they just do not understand how government and economics clash? Instead of saying "Obama approval rating," why don't they just say the "American stupidity index?" The two are completely synonymous. I got a POLL – How many people enjoy leaving comments here!! Well, I must say 100% do because at least their comments get posted – whether you are on the RIGHT or LEFT!! Try leaving comments on Fox News if you are a Liberal.......... NOT HAPPENING! The tougher the decisions he makes, the lower his polls. Based on this rationale I hope his numbers hit rock bottom as it will mean that I voted for the right man. One who is not concerned about getting re-elected but about doing what the country needs to have done. One who is not so much concerned with his popularity, and the popularity of his decisions so long as he feels confident that he's made the right choice for America. Obama has brought life and verve to the Presidency. No other president in recent history has energized the public in this manner. I know for a fact that he's gotten many cynics like myself re-involved and enthusiastic about "the political process". Obama 2012 and beyond if possible!!!!! None of the other presidential candidates in the last election would be doing any better than Obama is right now. He was left one horrendous mess to clean up. He's doing well with the disaster he was handed. He is doing a good job. God Bless America! Expect the empty suit of a President to plummet in the polls even further next year. Bush was a far better crisis manager than this ditherer! Obama is doing a fine job with the terrible deck dealt to him by creeps like Darth Cheney and Bush. It's ridiculous people expect Obama to fix everyhing in 1 year.